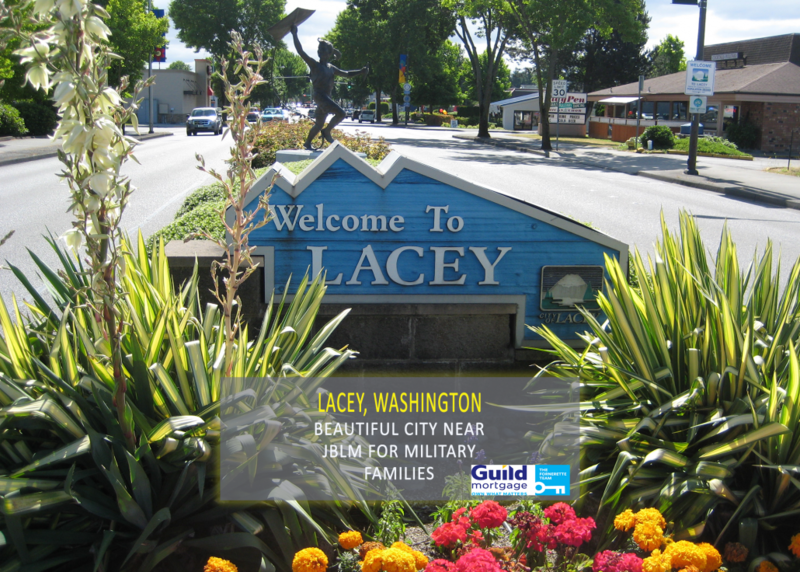 Lacey, Washington is a city in Thurston County about 25 minutes away from JBLM and is perfect for Military families. From the quaint neighborhoods, to the large shopping areas, to the great walkability, Lacey is ideal for those looking to work at JBLM, but live off base. The population of Lacey is about 45,000 and the average age is 35. The median household income is $59,407 while the typical house costs $223,600. 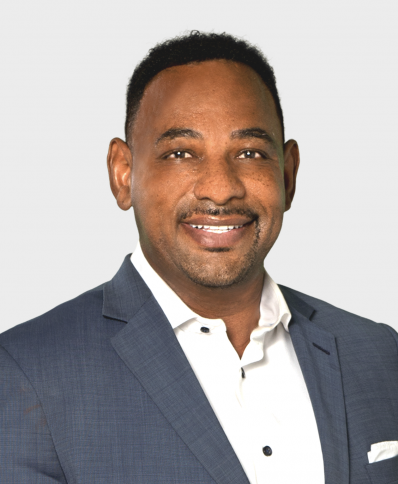 Currently, almost 20% of residents are civilian Veterans. Timberline High School and Aspire Middle School are rated 8/10 on the Great Schools Rating, while Horizons Elementary School is rated 7/10. All schools focus on no more than 20 students/teacher to ensure focused learning. Due to the new construction all around Lacey, WA, the crime rate continues to decrease year over year. Black Hawk Plaza and Hawks Prairie are the main shopping centers in Lacey, WA. 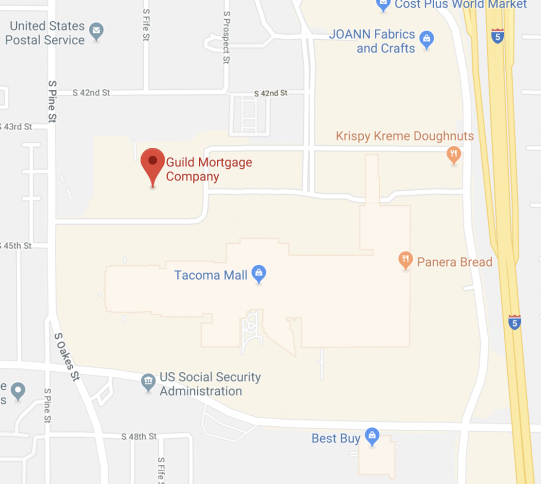 Some of the popular stores/entertainment locations include Safeway, Fred Meyer, Costco Wholesale, Best Buy, Big Lots, and Planet Fitness. Lacey also has some fabulous dining options. MiSo is an Asian fusion restaurant that specializes in Asian Fast Food. Some of the popular dishes include the Bulgogi Steak Salad, Ahi Tuna Rice Bowl, and an assortment of sushi. For those who are more into Southern food, Beau Legs is a popular Soul Food joint. With menu items such as the catfish basket, friend pickles, and fried okra, you’ll be spreading the word about this gem in Lacey. Lacey has some beautiful parks with updated jungle gym equipment and dog parks. Woodland Creek Community Park is a 72 acre green space with trails, a playground, BBQ grills, and picnic area. Rainier Vista Community Park is 46 acres with multiple sporting fields and a skate park. Thomas W. Huntamer Park is a popular picnic spot with a grassy parks that features summer events such as concert and film series. The parks in Lacey, Washington offer a little something for everyone. Lacey was recently rated #2 in best places to raise a family in Thurston County. It is a very clean small town that feels safe and a gives a friendly community vibe. There is plentiful wildlife such as deer, rabbits, coyotes, eagles, and more. Lacey is a healthy city that encourages exercise with trails, parks, and bike paths. 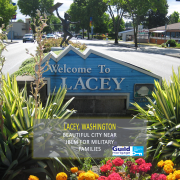 Lacey, Washington is a beautiful and quaint neighborhood less than 25 minutes away from JBLM.